Generally, I prefer to make spicy and cheesy toasts or sandwiches. But today, we're going to make a sweet toast recipe which is ideal for tea time or breakfast. It includes fresh blueberries, condensed and flavored yogurt with chopped almonds making it not only delicious but also ensuring it's nutritious too. You can also include cherries for the topping to make it more colorful. Instead of using whole berries, one can also experiment with the pureed form of the same. You can make these creamy toasts quickly in a few easy steps. After serving, it vanished within minutes and I had to prepare again upon request. So, let's get started and make these unique and delicious toast servings right now. Do make this delicious and fruity toast preparation which is enhanced with flavored yogurt and loads of almonds giving it a crunch as well as better taste. Microwave all the bread slices on a high setting for a minute. Keep aside. Combine condensed yogurt and milk with almond essence. Whip briskly for couple of minutes to make a smooth flavored yogurt base. 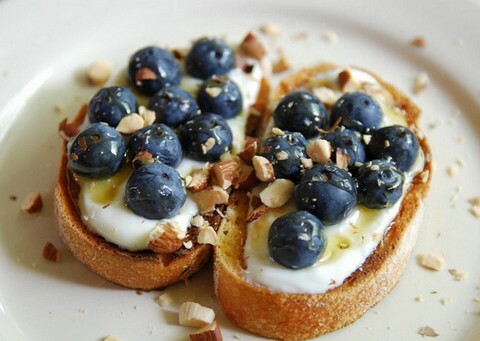 Make a layer of flavored yogurt on each toasted bread slice. Arrange fresh blueberries on top of it. Sprinkle chopped almonds on top to finish.